In this month's Sales Byte, I provide some tips for how to improve your sales processes while maintaining customers' trust - even customers who don't want t be "sold" anything. Also, our next Selling with TRUST® Platinum Edition session will be starting June 26 in Seattle. If you have Comfort Advisors that need some high-quality sales training, this is the program for you. Act quick, before our session fills up! Only two seats are left! Finally, our partners at Aeroseal tell us about some key benefits to duct sealing. Don't miss this opportunity to provide extra value for your customers, and make an additional sale! Service technicians are under increasing pressure to become sales superstars. It’s understandable. All businesses must create sales growth and the service technician is often a contractor’s best asset in terms of customer trust and contact frequency. There can be a downside to this strategy. Many examples exist where service companies adopted an aggressive service technician sales model and exploded with sales growth, only to eventually implode by destroying the very thing that created the initial success…the customer’s trust. If your technicians are telling you that their customers are starting to greet them at the door with, “I don’t want you to sell me anything.”, then it may be time to reconsider how you coach your technicians to engage customers, and improve their sales results at the same time. Train and support motivated sales professionals to achieve extraordinary sales success. Have you let your existing comfort advisors train your new one and they teach him their bad habits? Contact Tom at 425-985-4534 or tom@sellingtrust.com, or click the button below and fill out our online form at the bottom of the page. Aeroseal duct sealing from the inside… by now you have heard about it). But do you really know how big of a difference duct sealing can make for your customers? Many decisions your customers make is about comfort, right? When their air conditioner goes out in the middle of summer, they call you to get them comfortable again. When their old furnace is no longer keeping them warm and toasty in the winter – they call you to save the day. But what about when one room at the end of the upstairs hall is cold in the winter or hot in the summer. What about when their allergies are bothering them, and the house just smells musty and dusty… how can you help them then? The #1 reason homeowners choose Aeroseal duct sealing is to address COMFORT problems. Many homes we see suffer from comfort issues due to leaky duct work not delivering conditioned air where it is meant to go. As a homeowner, I wanted to know for certain that sealing ductwork would provide the promised benefits. I had my home Aerosealed more than two years ago, and couldn’t be happier! I live in a 2500 sq. ft. brick Cape Cod home that was built more than 50 years ago, and I was convinced my house had leaky duct issues. You see, my daughter’s room was upstairs at the end of the hallway – and sure enough, it was ALWAYS cold in the winter – even when we cranked up the heat so high that my husband and I were roasting in our first-floor bedroom. We finally had to get her a space heater to keep her even remotely comfortable. Same thing in the summer – she had two fans going and the AC temp set so low it felt like a meat locker on the first floor. Some manual zoning dampers had been put in by the home’s previous owners – but they only seemed to make matters worse. So, when Aeroseal was looking for an older home with brick construction on which to test its new wireless Aeroseal duct sealing model “HomeSeal Pro” – I quickly volunteered. The team came out in the morning, surveyed my home and got to work blocking off all the registers. Once complete, they did a pre-seal leakage test, and sure enough, my home had about 220 cfm of leakage – equivalent to a 41.5 sq in. hole in my ductwork. When the sealing process began, I watched the real-time graph on the screen slowing falling until it reached only 13.5 cfm of leakage. It took only about 15 minutes to achieve a 94% reduction in leakage in my ductwork. I was thrilled, to say the least. I could tell the difference immediately, and more importantly, so could my daughter! Registers that never even felt like they had air blowing out of them, were now fully engaged! My comfort issue was solved! AND…my benefits didn’t end there. I decided to track my energy bills for the next year so I could see how much I would save on my utility bills due to Aeroseal. I was astounded! Due to all the extra electric space heaters and fans we were running, our monthly utility bills were quite high. What a difference a year made. 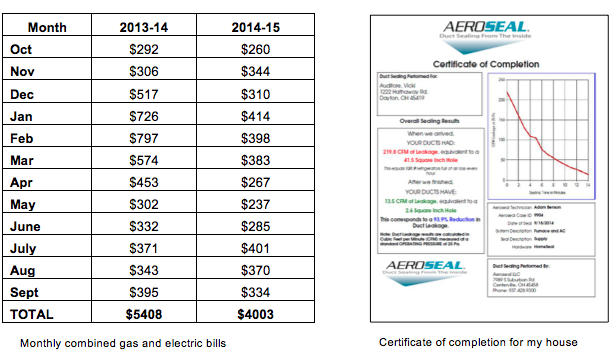 I saved nearly $1500 in gas and electric cost in ONE year with Aeroseal! It’s true, on average, 30 cents of every $1 spent on heating and cooling a home or building disappears into thin air due to duct leaks. But not at my house… at least, not anymore! And my story is just one of hundreds we’ve heard from homeowners all across the country and Canada. Check out this video clip from the Marilyn Dennis TV show about how Aeroseal helped a young couple keep their new baby warm and comfortable in the cold Canadian winter. Click here for more information about adding Aeroseal to your business, so you can help your customers be more comfortable AND save energy.